Gammastack has a notable experience in developing, executing and deploying customized applications. We have been at the forefront of custom software development for more than a decade and we have the ability to develop solutions based around a range of technologies. We help startups and enterprises by creating awesome software backed by concrete digital strategy, system integration, and consulting. Our team has the technical prowess that makes collaboration easy and cuts time-to-market greatly. We perform a multifold development work and efficiently churn your idea into a software you envisioned. 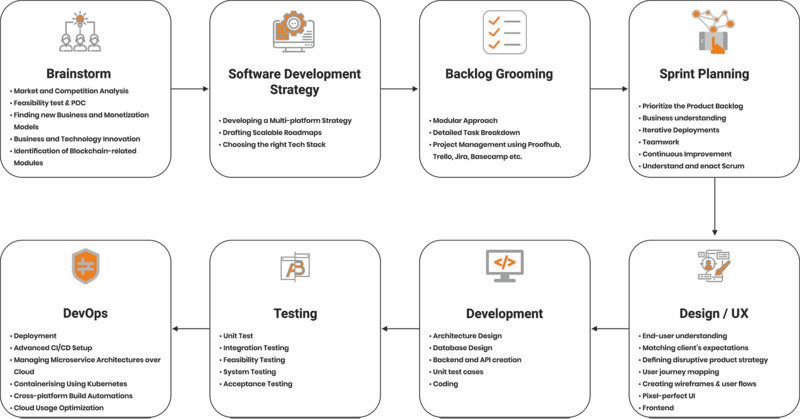 Our experts are well versed with latest technology trends and frameworks and follow a well-defined, iterative development model which covers all key aspects of project management. We take your intellectual property rights very seriously. To ensure your product and idea does not get misused, we sign an NDA from which will secure your codebase, designs and other deliverables. Our experts will work in tandem with you throughout product development cycle. We have our clients covered in all times whether they hit a roadblock or face technical issues. The contracts we propose are well defined and includes guaranteed clauses which will ensure that you get the customized software within time and the entire development meets the budget constraints. We develop industry-specific customized software solutions that work for top-tier organizations around the world. Having years of experience, we’re always on the move to take on new challenges and immerse ourselves in the latest technology trends to create high-quality software.